"Unique concept can provide an unlimited size lagoon, surrounded by picturesque sandy white beaches, anywhere in the world. 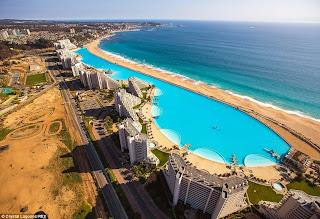 Their first project, the San Alfonso del Mar tourist complex in Chile, obtained the Guinness World Record for the largest swimming pool in the world, at a size of eight hectares. Crystal Lagoons expects a second Guinness World Record with the 12.5 hectares mega lagoon of the Citystars Sharm El Sheikh tourist complex in the middle of the Egyptian desert. Following that should be a third Guinness Record with the Mohammed Bin Rashid City project in Dubai, expected to be completed by 2020, that includes the world's largest crystalline lagoon with 40 hectares."